fuze H 12.5cm x 6cm diameter. 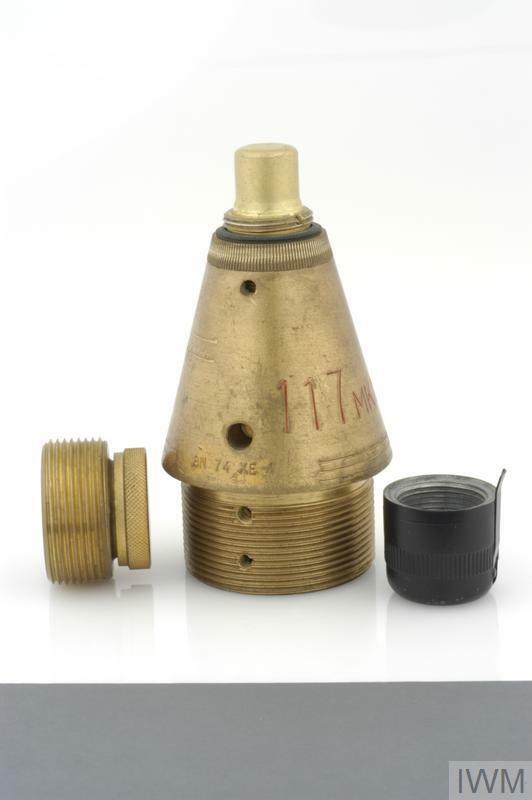 British No 117 Mark 15 (and Mark 17/7) fuze, manufactured in 1954. 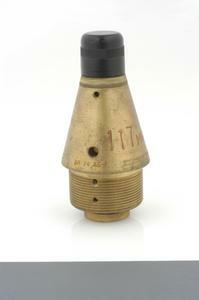 Trials with the No 117 percussion (direct action) fuze began in 1920. The Mark I, having a one-piece shutter similar to the No 106E, was introduced in 1925 and, the design being cancelled, was declared obsolete in 1931. The fuze was redesigned with a two-piece shutter and slightly longer body and the No 117 Mark II was introduced in 1931. The No 117 ran for twenty-seven 'Marks' several of which were still in service in the late 1960s. British No 117 Mark 15 (and Mark 17/7) fuze, manufactured in 1954, H 12.5cm x 6cm diameter. Trials with the No 117 percussion (direct action) fuze began in 1920. The Mark I, having a one-piece shutter similar to the No 106E, was introduced in 1925 but was declared obsolete in 1931 and the design cancelled. 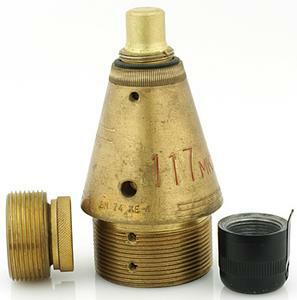 The fuze was redesigned with a two-piece shutter and slightly longer body and the No 117 Mark II was introduced in 1931. The No 117 ran for twenty-seven 'Marks' several of which were still in service in the late 1960s.